This book began with a man and a book. 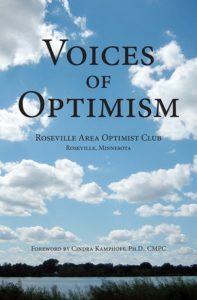 Don Salverda, the founder and first president of our club—the Roseville Area Optimist Club, located in Roseville, Minnesota—gave Hal Urban’s book titled “Life’s Greatest Lessons” to one of our members. After she read it, she loaned it to a promising college student. He wrote a thank-you note to our member that she shared with Don. Both were impressed with the thoughtfulness and maturity represented by the note. Our member began thinking about lessons she could share with the college student so he could avoid some she learned “the hard way.” Fortunately it occurred to her that she belongs to an organization of accomplished civic officials and business leaders who, through the tenets of Optimist International, are dedicated to the “development of youth, our community, and ourselves.” She proposed to Don and the board of directors that the club produce a book that would be a collection of stories contributed by members and guest speakers. The stories would relate an account from the author’s life experiences that a young person would find to be valuable. With important input from the board, the project was launched. Sixty-six percent of the members and ten guest speakers, including a former U.S. senator, associate justice of the Minnesota Supreme Court, and respected leaders, contributed their stories. The member who proposed the project edited the stories, designed the book, and managed the project at no charge. We invite you to savor our stories, enjoy them, and share them—along with your own story—with someone who is important to you. “You asked members and guest speakers to contribute their story, and they came through. The stories are all so real.”—Ruth L.
“Each story starts somewhere, and most end up overcoming adversity.”—Dottie H.
“What I like is that I can pick up the book and read one or two stories in a few minutes. And many of the stories are funny.”—Kim S.
“That’s a helluva book.”—Jim K.
“What a variety of stories, especially considering that everyone was responding to the same invitation to contribute one story to share with a young person.”—Lynn D.